If you’ve ever bred fish, either intentionally or accidentally, you’ve probably been faced with the problem of having way more young fish than you can handle. Perhaps you’ve been told to cull the juveniles early on. What does that mean, and how do you go about doing it? Simply put, culling fish is the process of weeding out some of the young fish to reduce their numbers to a level that is appropriate for the size of the aquarium. In some species of fish, it is not unusual for hundreds of fish to hatch at once. Few aquarists have the space to house that many fish, which means that either the fish must be culled, or the entire clutch may be lost due to deteriorating habitat conditions that result from overcrowding. Any time a living creature is put down, the question of cruelty invariably arises. Yes, it does seem harsh, but the same thing occurs naturally in nature. Fish are one of many species that produce excessively large numbers of young, many of which will never make it to adulthood. If all the young were to survive to reach adult size, the available resources would be depleted, upsetting the ecological balance. The young fry that doesn’t make it are a source of high-quality protein to other animals. It is the circle of life and ultimately quite natural. Culling aquarium fish may seem gut-wrenching, but if you approach the task with the natural process in mind, it isn’t all that hard. In nature, the smallest, weakest fry would either die or be eaten by predators, as would deformed fish. Those are the ones you should cull out. Another determining factor may be the coloration and markings of the fry. Although they don’t always display full coloration or markings at an early age, you will usually be able to pick out some that are drabber compared to the others. Those are candidates for the cull. After identifying the malformed, paler-colored, weaker, and smallest fry, separate them from the others. You’ll often find that they are easier to capture than their stronger counterparts. Once separated, dump them in the tank with adult fish, which will be delighted to have a live meal and benefit from the nutrition. 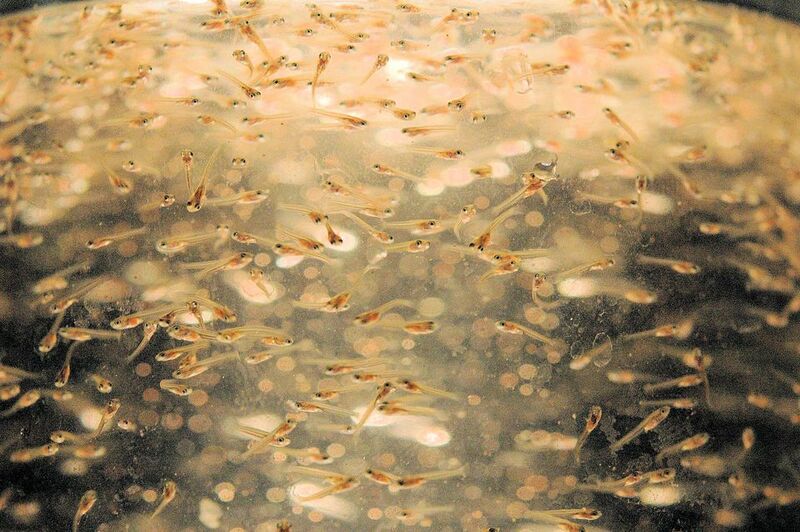 The remaining fry will have a better environment and be more likely to grow into healthy adults. Remember that when culling does not take place, fry tanks often suffer heavy losses, due to overcrowding. By culling, the best fry is given a better chance. It’s the right thing to do – not a cruel practice. If the culling process still seems far too barbaric for you, there are a few options. The first is to set up another aquarium (or two or three) to house the fry. Separate them early to give them as much room to grow as possible. Keep in mind that unless you plan to get rid of these fish, you are likely to have even more fish on your hands once they grow to adults and start reproducing. Another option is to sell the fish or simply give them away. Local pet shops will often take fish off your hands as long, as they are a desirable species. Sometimes businesses that keep an aquarium in the lobby are also willing to take excess fish. Last but not least, check your local schools to see if they accept donations of fish for their classrooms. As a word of caution, you should never get rid of undesirable fish by dumping them in local waterways. Odds are that they will be eaten by the local inhabitants, so you haven’t done them any favors. However, in the case of aggressive aquarium fish, they may wreak havoc on the native fish and local habitat.